This is a challenging event starting in Slane, heading N.W. through Longford, Leitrim and turning back through Fermanagh and Cavan. Most of this route is through quiet rolling countryside. The last 100k is through drumlin landscape which requires steady pacing. As part of this route goes through Northern Ireland, you should take some sterling. Snail Mail: Download Entry Form here New Entry Forms and post to Eddie Dunne, 51 Danesfort, Castle Avenue, Clontarf, Dublin 3. 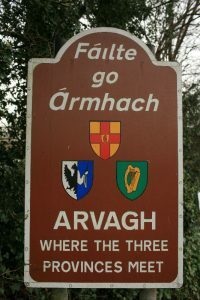 There is free parking available in Slane village, especially Navan direction. Facilities: None, this is be a self-supported event. Please read this page for more details on what self-supported means ! Lights are mandatory for this event, as for all Audax Ireland events over 200km.